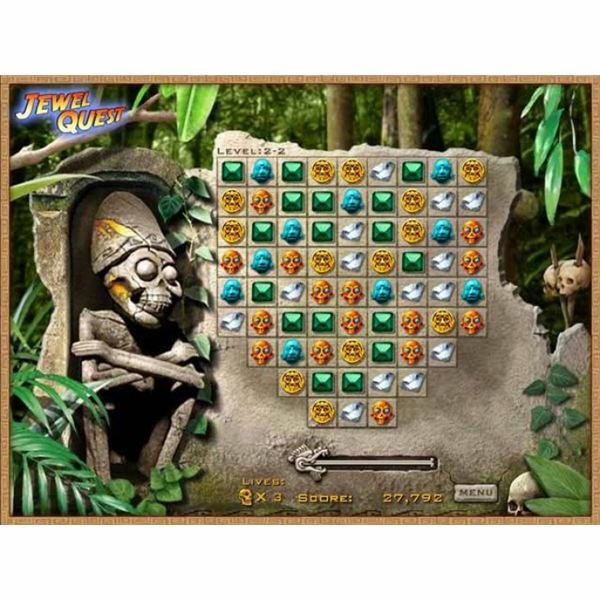 Jewel Quest III is the second sequel to Jewel Quest, which is one of the highest rated and most popular match three games available. Just when you really thought that the suffering of Rupert was coming to an end, there is yet another disaster that sets him off on another adventure. Rupert and Emma, his wife, are drawing very close to actually opening a museum that they have been dreaming about. This museum will be the home of their wide array of artifacts that Rupert has over the years been collecting. That was until Natalie, the couple’s daughter, was involved in a horrible accident when she was playing with her father’s jewel board. While playing she opened up a secret area that released spores that were do dangerous they caused her to go blind. Rupert suspected Sebastian Grenard, one of his nemesis, of putting the spores inside the compartment of the jewel board. Rupert thought it was Sebastian’s way of revenge because he had stolen Emma back. Rupert must now put off opening up his museum in order to travel around the world on a hunt to find a cure to help restore Natalie’s sight. The basic game play of Jewel Quest III involves lighting up three of the same icons located on the grid. Once you have matched three or more of the same icons they will disappear, giving you more points. The space that is left by the disappearing icons is then filled with even more icons that will drop down from above. When this happens you have a chance of these icons matching and disappearing also or you might find that nothing at all happens. It really is a game of chance. In the main game of Jewel Quest III the basics of the game play are changed up just a little bit as you travel around the globe. There is a story line within the game about Rupert and his family but this is really only told through the text that is shown before each game which once you have played Jewel Quest III a few times you might just skip over. Some will say that the story line is an asset to the game but I can’t seem to see why that is. Each screen is virtually the same with a few differences which is enough to keep me clicking but the story just seems to honestly take up space and time. I have found that a quick read of the text is occasionally beneficial since it might just contain a hint to the next board or tell you what needs to be done within the challenges of the game. But overall, the story of Jewel Quest III is really a part of the game that isn’t that important. As you travel from location to location matching up the icons and turning new grids into gold you will come across different mechanics that are within the game to help give it a little variety. These can however become quite annoying for some players. In several of the stages you will find yourself dueling different characters trying to get your whole board to turn gold before they do or to obtain a certain total before they do. All in all it seems to work well and give the game some variety from the overall basic set up which is for me too much repetition to keep me hooked for very long. 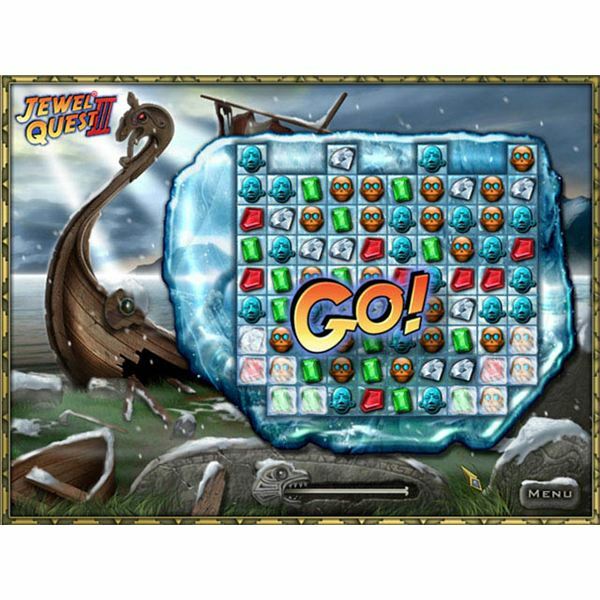 Overall there is a lot of content in Jewel Quest III and if you are looking for a newer version of Bejeweled then this is the game for you. 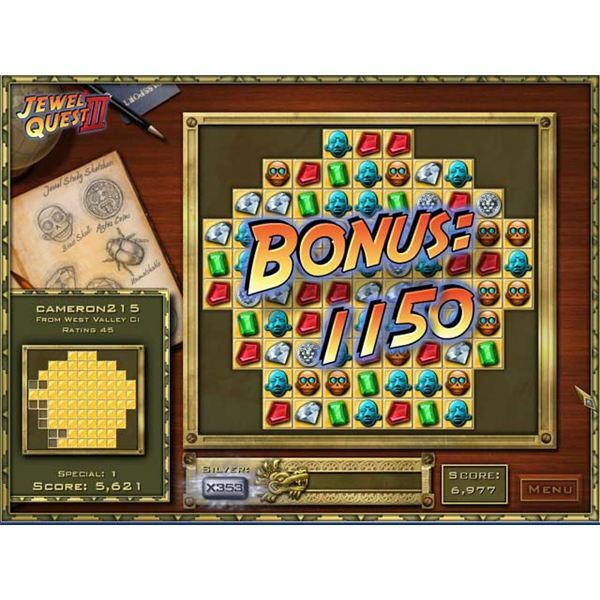 Just like most other match three games, Jewel Quest III has a very high appeal because there are really no hardware issues which means that virtually any computer can play the game with ease. Match three games also are usually quite affordable with little to no investment needed. Jewel Quest III has a free 30 minute trial that will allow you to try out the game at no cost to you. If you love it you can purchase it for only $19.99. For the hours of game play you will enjoy that is a really reasonable cost for Jewel Quest III. Give it a try, you might find that you spend hours upon hours clicking away while playing Jewel Quest III.